The final factor, Type of Relationship, refers to how the worker and the business perceive and operate their relationship. This includes contracts, employee benefits, term of the relationship, and services provided. Generally employee benefits include insurance, paid vacation and sick days. 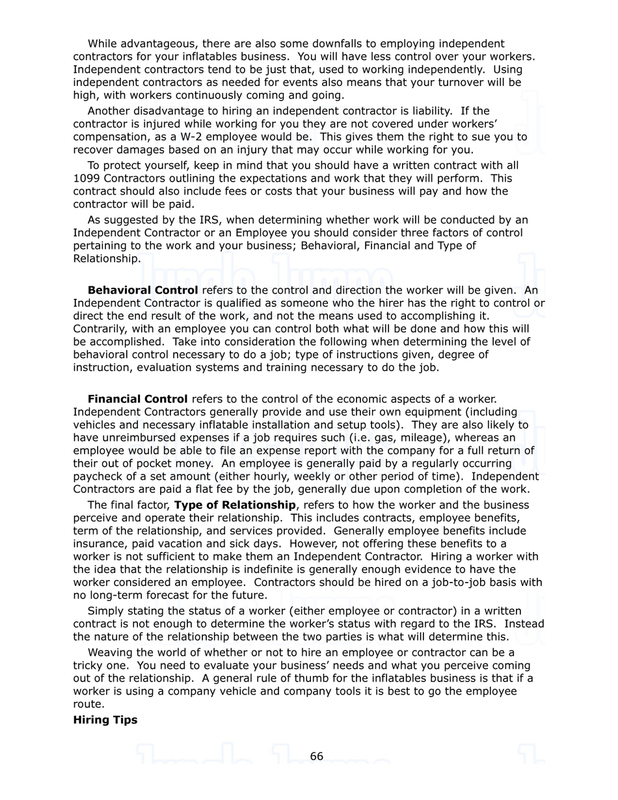 However, not offering these benefits to a worker is not sufficient to make them an Independent Contractor. Hiring a worker with the idea that the relationship is indefinite is generally enough evidence to have the worker considered an employee. Contractors should be hired on a job-to-job basis with no long-term forecast for the future.Simply stating the status of a worker (either employee or contractor) in a written contract is not enough to determine the worker’s status with regard to the IRS. Instead the nature of the relationship between the two parties is what will determine this.Weaving the world of whether or not to hire an employee or contractor can be a tricky one. You need to evaluate your business’ needs and what you perceive coming out of the relationship. A general rule of thumb for the inflatables business is that if a worker is using a company vehicle and company tools it is best to go the employee route. Hiring TipsAs nice as it would be, It is not possible for you to be in more than one place at a time. As your inflatable business grows, and you have multiple events going on at the same time, so to does your need for additional employees to assist you in the set-up and dismantling of inflatables. The safest best when hiring a new employee is to go with someone you know or who is referred to you by someone. Knowing the person, their work ethic and personality or having someone vouch for the prospective employee is a great advantage to you. Of course you do not always have the luxury of knowing anything about an employee before hiring them, except for what you are able to determine from interviews. Another key point that you are looking for when hiring a new employee is to find someone that already has experience working with inflatables. However, because this is more of a niche market it may be a challenge to find someone with this type of experience. Since the employee will be primarily working independently it is important you find a responsible, trustworthy individual that is comfortable working with people and children. The following are some sample questions to help you determine if the prospective employee has the characteristics they will need to be a good fit for your inflatables business:Why are you interested in working in the inflatables business?Tell me about yourself and your last / current job?Tell me about a time when you worked independently.Tell me about a time when you demonstrated trustworthiness at work.Give me an example of a time when you were able to successfully communicate with another person.In what type of work environment do you work best?An additional creative approach to interviewing potential employees is to walk them through the process of setting up and dismantling an inflatable. With some instruction you can quickly determine how the employee will work alone, and whether they are likely to get flustered or retain their cool. You can even go so far as to role play a situation, acting as the inflatable customer. Take note of how the interviewee interacts with you and their demeanor. Is this someone that you would want representing yourself and your company to your customers?